Everything was on a downward spiral in Derek Mills’ life – his work, his physical and mental health, his relationships with family and friends. But it only took one insignificant question from an office security guard one night for Derek to stop, connect deep within himself and in the next 10 seconds begin to see a way to change his entire life completely. Over the next few years this led to him making amazing changes that created balance and harmony in all areas of his life, becoming a millionaire businessman and developing and sharing his methodology, The 10-Second Philosophy®, in front of international audiences as a speaker and coach. In this book, Derek invites you to use the words, phrases and questions we encounter in our everyday lives to stop, go inside and access our TrueSelf. From this place, we can set Standards® – not goals – for all areas of our life, to experience the same amazing transformation that he did. 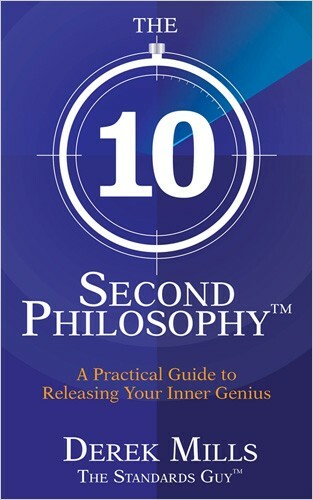 With stories, philosophy, exercises and quotes, this is a book of practical enlightenment from a man who became an unintentional guru for many people when they started asking how he changed his life around and how they could too. This is his story so far and it can be the doorway to your own journey of change and instant success.